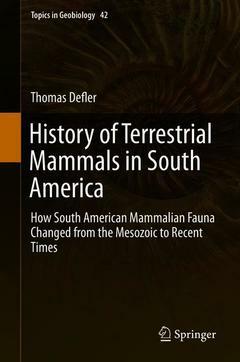 This book takes a non-technical approach in covering the evolution of South American mammalian fauna throughout geological history, and discusses how South America has changed due to mammalian invasions. Unlike other works on the subject, this book attempts to answer several crucial questions that often go unmentioned together in one cohesive monograph. What was the fauna like before the American interchange? What were the origins of the now-extinct groups when northern species arrived and out-competed them? How did the modern mammalian fauna come into being with such disparate animal groups? This information is given from a historical perspective throughout the book's 15 chapters, and is presented in an easily graspable fashion by mostly avoiding technical language. The book is written for academics, scientists and scholars engaged in paleontology, zoology and evolutionary biology, but may also appeal to a larger audience of general readers interested in mammalian evolution. The book begins with an introduction, describing the tools necessary to interpret the evolutionary history of South American mammals in geological terms and some of the early people who helped found South American mammalian paleontology. Chapter 2 describes the Mesozoic first mammals of Gondwana and what we are learning about them, dominant before the K/T extinction event. Then chapters 3 through 8 cover the Cenozoic, or "Age of Mammals", highlighting the major mammalian groups of South America that replaced the earlier mammals of Gondwana. These groups include the marsupials, native ungulates, the xenarthrans (armadillos, anteaters, sloths), the caviomorphs (rodents), and the platyrrhine monkeys. Chapters 9 and 10 address the Antarctic La Meseta fossils and the Colombian La Venta fossil faunal assemblages. Chapter 11 discusses the neotropical mammals that invaded the Caribbean Islands, and illustrates the influence South America has had on adjacent faunas. Chapter 12 describes the origin of the Amazon River and the role it has played in the evolution of the mammals and other flora and fauna. Chapter 13 tells the story of the Great American Biotic Interchange (GABI), and chapter 14 follows this up with a discussion of the Pleistocene mammal communities and their eventual extinction. Chapter 15 concludes the text by discussing the modern mammals of South America, and how despite the extensive Pleistocene extinctions there is still a lot of mammalian diversity in South America.